The DIMENSIONE furniture concept store was born out of the creative spirit and foresight of founder BEN CHAN. 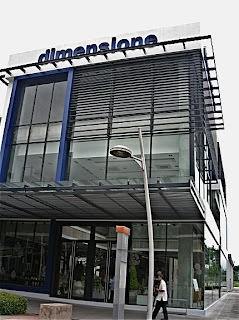 Established in 1976, DIMENSIONE has presently 16 outlets nationwide and is scheduled to open more stores by the end of this year. Home and office furniture as well as home accents complete DIMENSIONE’s product mix (pronounced Di-men-sho-nee). Seeing the potential of imported modern but affordable furniture pieces, products from Europe, North America, Thailand, Malaysia and other Asian countries were sold aside from the locally manufactured items. DIMENSIONE understands the necessities of modern day living. With young urban professionals, young upwardly mobile mommies, and other young couples opting for studio-type homes, townhouses, and apartments, the trend is towards minimalism yet never sacrificing style. DIMENSIONE features an innovative and modern approach; carrying contemporary, imported and high quality furniture pieces and accents for the home and office at affordable prices without compromising comfort. The staff of DIMENSIONE regularly attends international fairs and exhibits to be updated on the new trends and store ideas. True enough, the store opened a new branch at the Fort specifically in the open space mall Bonifacio High Street. 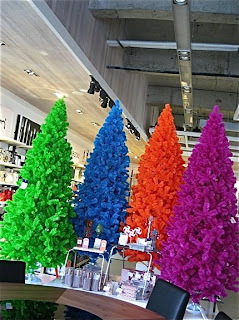 Spotted are these colorful Christmas Trees. Christmas don't get celebrated as early as in the Philippines. Bad customer service. After I paid, they delivered the wrong items twice. Then on the 3rd attention, they're asking me to pay additional amount for their mistake of putting the wrong tag price on the product I chose. Does Dimensione intentionally put the wrong tag price? Or their sales people are so stupid that they don't know what they are selling? Sometimes it's tricky.